There are a lot of bugs in Hawaii. Most of them make loud, crunchy sounds as you ride over them with your bike, or accidentally squish them with your sandals. Not once have I ever thought to collect them and serve them up for dinner. The local term for delicious, "broke da' mouth", would certainly not apply to these oreo cookie sized cockroaches. Which brings me around to the pictures above taken at a recent dinner party at our home as part of the Celebrate Science annual dinner with the authors. Each year we try to have a themed dinner for our illustrious guests. One year it was a trip to the Wine Research Centre at UBC. Another year it was the Science of Wine and Cheese where we learned that the perfect cheese to pair with Ice Wine was oddly stinky blue cheese. It was with great trepidation and a serious amount of alcohol that a somewhat reluctant group of science lovers enjoyed some unusual appetizers or pupus as we call them on the big island. Professor Murray Isman, Dean of Land and Food Systems fried up a pan of juvenile and mature locusts and baked a tray of meal worms for our enjoyment. 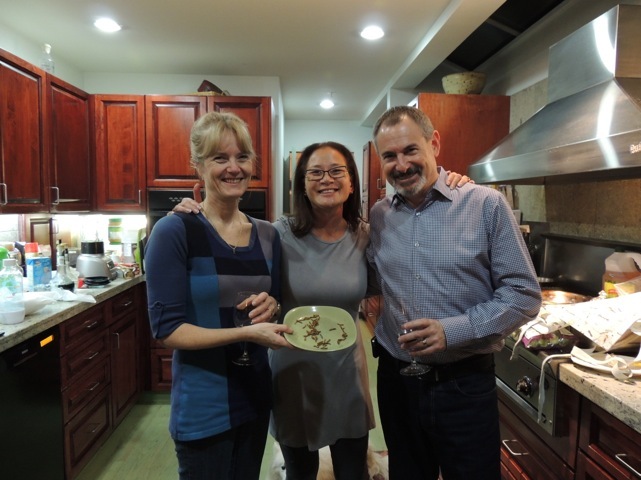 The Dean's wife, Susie gave it a wide pass as she is allergic to shellfish and much to her glee, the locusts have outer coatings which contain chiton, the same material that is found in shrimp and lobster. As for taste, anything with enough garlic, butter and a dash of liqueur is pretty good. The locusts were crunchy and quite good, while the meal worms were somewhat like peanuts. They were an acquired taste. 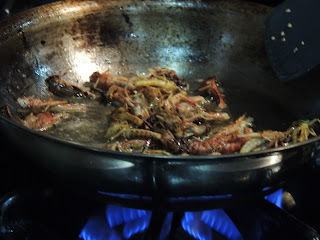 While I might not want to serve these on a regular basis, about half the world includes insects as part of their diet. Bugs, as it turns out are the perfect food. The average beef burger contains only 18% protein and 18% fat; the same amount of grasshopper would give you 60% protein and only 6% fat. 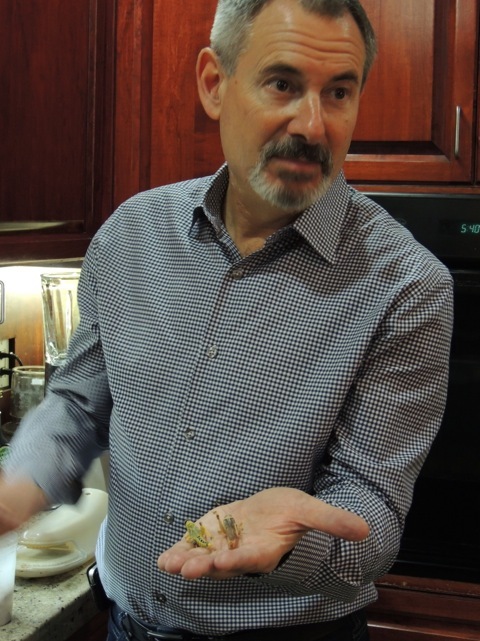 The fat in insects is unsaturated, making them a healthier alternative to meat. Beef contains 9 mg of iron- while there is 2 mg for the same weight in grasshoppers. Now getting into the eat locally trend, locusts can be home grown. They have a very small carbon footprint . If you raise your own they don't have to be transported over any distance by truck, train or plane. 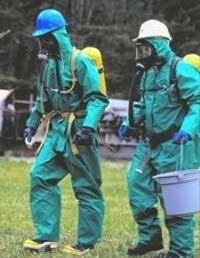 No machines are used to harvest them and obviously pesticides can't be used in raising them. They don't need steroids or additives. No questions about ethically raising these bugs and killing is done in the pan. Grasshoppers and their like are not GMO as who in their right mind would want to create cow sized bugs? There is no shortage of these creatures around the world. Earthworms, meal bugs, locusts and other edible creepy crawlies are found in abundance everywhere. Before you get too self righteous about eating bugs, don't be so smug. Ground up bits of bugs find their way into processed foods every day. In fact you would be surprised just how many you are eating each time to have a something powdered, baked or floured. Next year instead of carving up a roasted turkey for the holiday, try making an entree of sautéed locusts with a side of meal worms. The earth will thank you for it. Do science and outdoor sports go together for you? They do for me! I do a lot of thinking when out in my kayak. Sometimes the things I see when kayaking remind me of birdwatching and climate change science. But most recently, while out in my kayak I passed a floating plastic bag that might have blown off a boat, and a sunken tin pie pan that was probably frisbee-ed from shore. Seeing human trash reminded me of why I had to get to my computer and write this post. There have been a series of fuel spills locally, where I live in Saanich, part of Victoria. You can read about one of the first recent spills in the Saanich News in their article appropriately titled "Oil spill stains urban miracle." It's on the front page, with a sub-heading "Catastrophe strikes Coho-laden creek." I hadn't thought of an urban creek being the subject of study for working biologists, but it is. And there are school visits to the creek as well, so that students can learn about Nature in their own home neighbourhood. 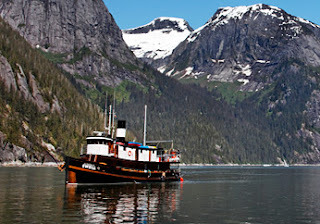 My friend John Herbert took this photo of Colquitz Creek. That's the salmon stream that we've written about here, the one that runs from Beaver Lake through Panama Flats to Portage Inlet. This spill was from a home heating oil tank that leaked. It happened when a fuel delivery was made to the wrong address, and the wrong home's unused tank was filled with home heating oil. A pipe leading from the fuel tank sprung a leak, and over a few days released an estimated 1,000 litres of heating oil into Swan Creek, which drains into Colquitz Creek. Once the oily sheen on the stream was pointed out to Saanich municipal workers, they traced the fuel up to the source of the leak. Other leaks have since been traced back to other tanks. These fuel tanks weren't mine or in my own neighbourhood, but I must have walked within a hundred yards of them several times before eating and relaxing at a nearby home of friends or family. That's it, for me. Not in my back yard. Not in my friends' and families' back yards. Accidents happen, but fuel tanks are owned by people who can look after them. No excuses. When I walked back from the beach, I put the kayak away and looked at my landlady's fuel tank. No visible leaks. Not in my yard. I'm no fuel-servicing expert. 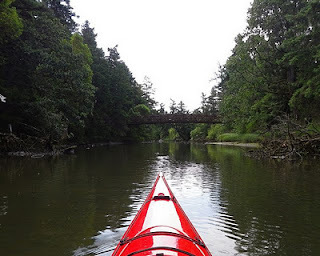 I'm not a marine biologist, or a fresh-water biologist either, but I do get out on the water often in my kayak. 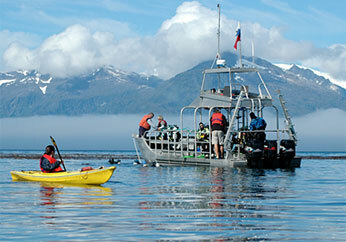 Every small boat user interacts hands-on with the water in a personal way. We can understand the effects of fuel spills on waterways, effects that some people don't easily understand because they don't see the plants and animals like we do. Now I'm trying to put that understanding to use. 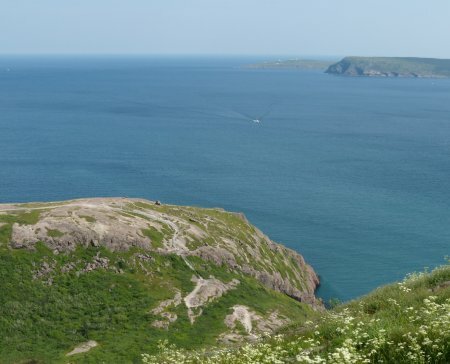 A fact sheet from the provincial Environment Ministry says homeowners are potentially liable for cleanup costs whether they are aware of the existence of an oil tank or not. Scary thought, eh? And home insurance doesn't cover fuel spills. One of the recent cleanups cost the homeowners $35,000. It seems that tank leaks can happen suddenly and aren't as obvious as the crack along the coaming in my second-hand Pamlico kayak from Wilderness Systems. So I will remember the statements by experts in the local newspapers: twenty-year-old fuel tanks can and do fail suddenly. I don't have to be a fuel expert to help my landlady make a proper plan for the fuel tank at her house! That's practical science we can put to good use. With planning, this home heating system will never be the cause for an expensive and environmentally damaging spill. We can't stop all the fuel spills in the world, but we can each look after our own equipment. And if you see any fuel spilled on the ground or water in BC, in town or out in the boonies, call the 24-Hour Spill Line toll-free at 1-800-663-3456. Any dog owner will tell you that their pet understands them - recognizes words, follows commands, and somehow knows when they need a sympathetic snuggle. Scientists call this communicative skill and intelligence "social cognition." It's the set of knowledge and behaviours that animals - including humans - need in order to survive in social groups. In the case of the dog, humans are a natural part of that social group, and language is one of the major ways humans communicate. Use of human language by dogs is a developing field of study. Take Rico, for example. Rico's owners claimed that the border collie knew the names of 200 objects, and would retrieve each item on request. Scientists were skeptical at first - after all, a horse known as "Clever Hans" wasn't actually counting, but reading his trainer's body language. However, when Rico had to go into a separate room to find the toy his owner asked for, where he couldn't receive any additional clues, he still got it right 37 out of 40 times. 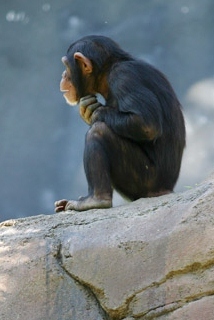 Rico's vocabulary, though on par with trained apes, dolphins, and parrots, wasn't that interesting to scientists. What they wanted to understand was how Rico learned the names of new objects. They placed unfamiliar items in the room with toys that he knew, then asked him to retrieve using a brand new word. Seven out of 10 times, Rico brought the new object. He was using exclusion learning - "I know the names of all of these things, but mom used a different word, and therefore...." This "fast mapping" is the same technique human children use during language learning, and Rico's success rate was comparable to that of an average 3-year-old. Scientists have shown that when humans generalize new words to categories of objects, they do so based on shape, rather than size or texture. For example, if shown a ball for the first time, kids will extend that label to other spherical objects. Similarities in size and texture are less important - a golf ball and a whiffle ball are both balls. Would the same true for dogs? A second border collie, Gable, was taught that the word "dax" represented a small, fuzzy, U-shaped object. He was then asked to identify the dax among objects with different sizes, shapes or textures. Unlike people, Gable generalized the word dax to objects the same size, not shape, as the original. He also used texture as an indicator. Scientists believe that humans rely on shape because, in general, vision is our dominant sense. It's less clear why dogs may be relying on different indicators, but the results suggest that there could be fundamental differences in the way dogs and people learn and understand language. Which makes it even more incredible that we manage to communicate at all! The video of Gable is from: van der Zee et al (2012) Word Generalization by a Dog (Canis familiaris): Is Shape Important? PLOS ONE: e49382. You can find more videos at the article's home page. I visited a school a few days ago to talk about my books and, as usual, passed around the contents of my “museum-in-a-bag,” a collection of, among other things, skulls, dinosaur bones, desiccated insects, snake skins, feathers, and a mummified bat and two hummingbirds. The children are always very careful with my treasures, but that day my white-tailed deer skull finally snapped in half. I wasn’t exactly surprised, since this particular skull has been handled by at least 5,000 kids over the past few years. Besides, I can always glue it back together again. I’d like to save it, though, because, like many of the things in my bag, the deer skull has a story. 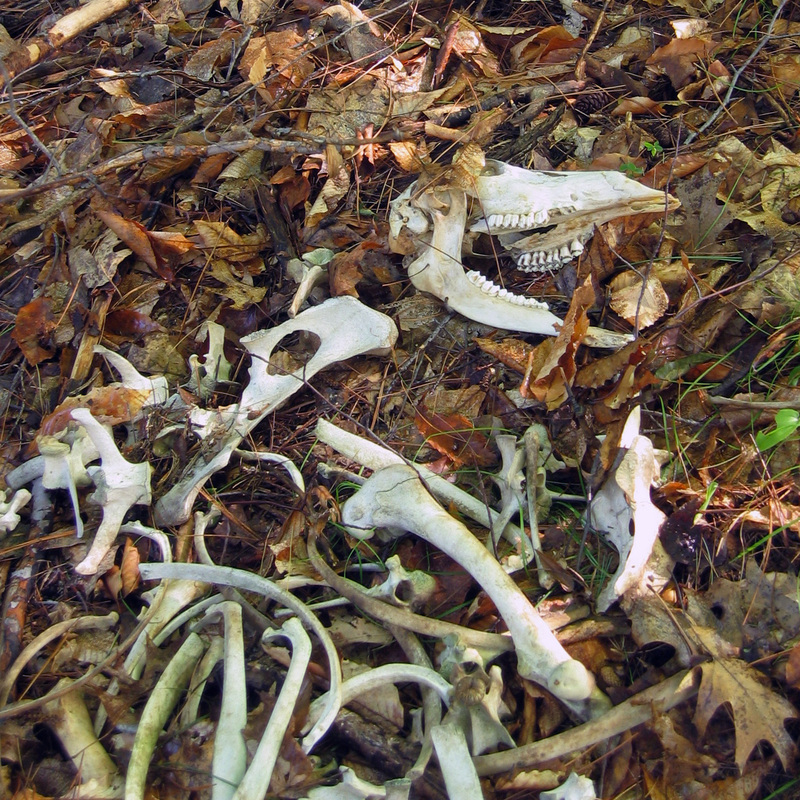 I found it, along with most of the rest of the deer’s skeleton behind a fence on my road. It’s not hard to imagine how the animal died: I’m sure someone struck it by accident with their car. Though mortally injured, it must have managed to make two great bounds, one to get off the road and the other to get over the fence. The person who hit it must have been relieved to see it disappear into the brush as he or she drove away. But then, alone, the deer collapsed and died. A year earlier, I had looked for puffballs in exactly the same spot in late autumn. There were no deer remains then, so the longest it could have been hidden there was twelve months. Amazingly, other than a few wisps of hair and a couple of snippets of dried skin, the skeleton was completely clean – clean enough that I had no qualms about bringing it home. So who do I have to thank for cleaning those bones for me? Scavengers and decomposers, that’s who – my favorite characters in the food chain. I was quite sure a coyote must have visited the corpse of the deer shortly after it died since the bones of two of its legs were missing. The coyote is the only animal in my neighborhood that is strong enough to drag away such large parts. Though they’re predators, and often hunt for food, coyotes are also such frequent scavengers that they’ve developed a special receptor in their brains that makes them immediately throw up anything that is dangerously rotten. 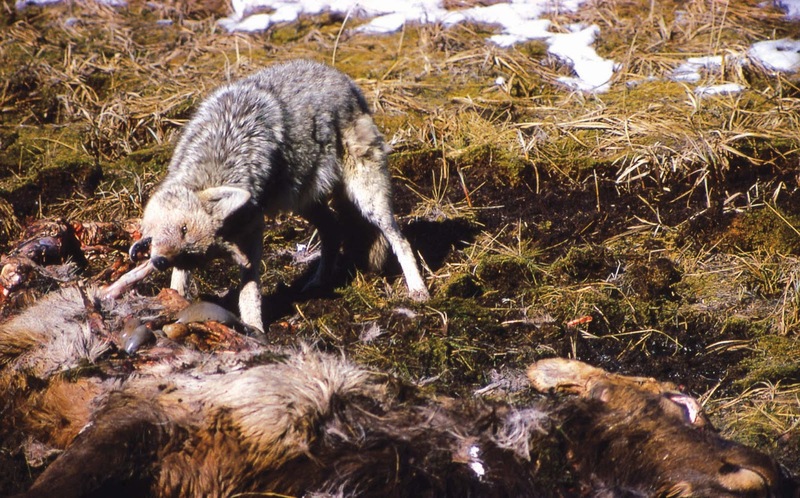 So a coyote wouldn’t have had to feed on the carcass immediately, especially if the deer had died in the cold of winter. Other scavenging mammals, such as foxes and skunks, might also have visited the corpse, as well as birds, such as crows and vultures. 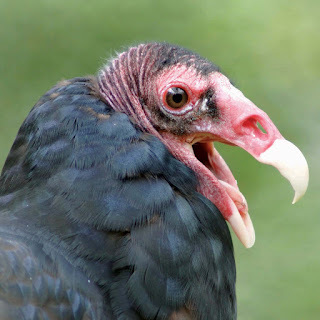 Our local turkey vulture is one of the few large animals that is a dedicated scavenger, which means that its only food is carrion, or already dead or decaying flesh. They’re perfect for this job: they have an extremely well-developed sense of smell that allows them to home in on food that's miles away; their bald heads reduce the amount of rotting matter that might stick to them; strong acids in their digestive tracts destroy harmful bacteria; and their urine is also very acidic – and here’s the best part – so they pee down their legs to let the acid destroy nasty bacteria clinging to them. As well as being fed upon by these larger animals, in the warmer months corpses attract an amazing number of insects. A variety of flies are lured by the smell of death and lay their eggs. 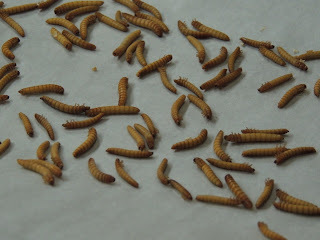 Their larvae, or maggots, are voracious carrion feeders. 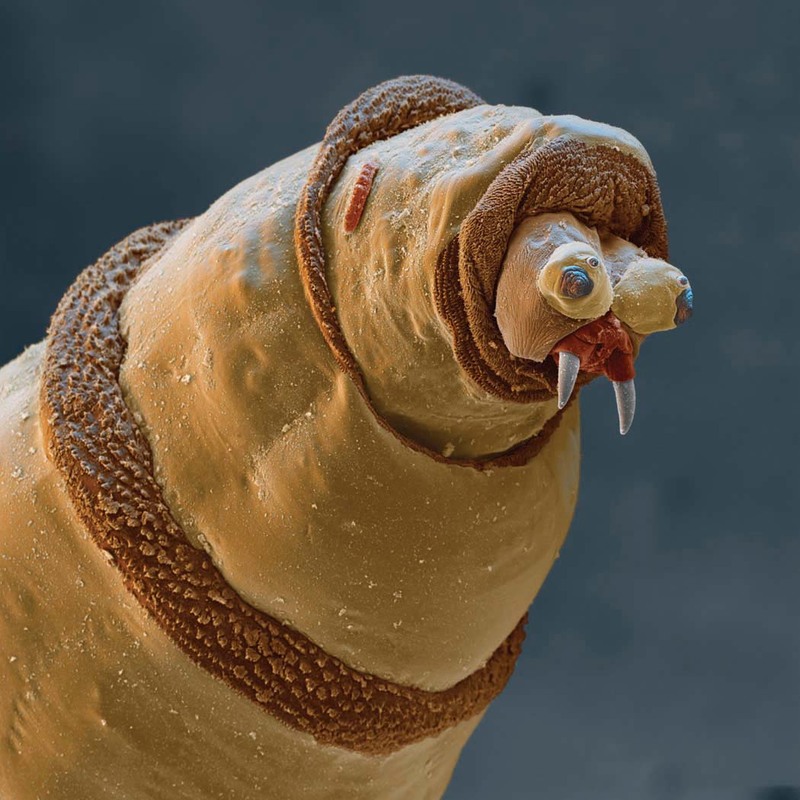 Flesh-eating beetle larvae continue the job and, later, other beetles with specialized mouth parts show up to feast on tough skin and ligaments, followed by moths that eat fur and hair. These insects all arrive at such specific stages of decomposition that forensic entomologists, scientists who study the insects that are found on or near dead things, can use their knowledge of this progression to determine the time of death when the remains of a human are found. Throughout this whole process bacteria are active, gobbling up the corpse from within. These bacteria produce gases as a waste product, and it’s these gases that are responsible for the putrid odors that waft off rotting animals. Humans are naturally revolted by these smells, which is a good thing. If we weren’t disgusted by the smell of decomposition, we might be tempted to eat food that has gone bad and get sick from the bacteria growing on it. Interestingly, almost everyone in the world says the same thing when confronted by these smells, some version of “Yuck!” or “Ick!” This verbal gagging is so natural and so universal that some people think it might be the way that human language began. My tip to anyone who finds an animal skull (or other bones) and wants to bring it home, is to use your eyes and nose. If it looks gross and smells disgusting, leave it where it is. Mark the location and return in a few months. 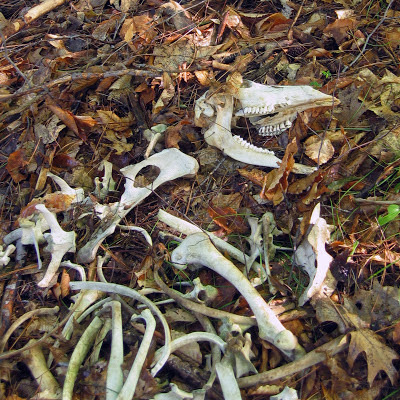 More often than not, scavengers and decomposers will have completely cleaned it up for you. “The role of a geologist is much like the role of a crime scene investigator,” says Joel Cubley, geology instructor at Yukon College in Whitehorse. Geologists try to figure out what happened long ago in Earth’s history from small, fragmentary clues, he explains. But what took place long ago was certainly not small. Cubley’s specialty is tectonics, and that’s just about as big as it gets. It’s the study of the movements of the great plates that carry the continents slowly over the face of Earth, pushing up mountains and excavating oceans as they go. the Atlantic Ocean is slowly getting wider. Tectonics is a relatively new field. About a century ago, German scientist Alfred Wegener suggested that the continents move, but most geologists thought he was talking nonsense. It wasn’t until well into the 1950s that American scientists using sound waves to map the ocean floors found proof of Wegener’s theory. Marie Tharp, one of the few women working in geology at the time, spotted what looked like a rift valley on the floor of the North Atlantic Ocean. It turned out to be exactly that — a place where two parts of Earth’s crust are pulling apart, widening the ocean and pushing Europe and North America away from each other about as quickly as your fingernail grows. Even that slow movement, over time, can create huge changes. 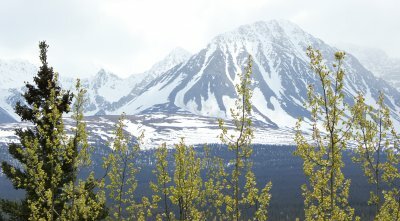 On the west side of North America, tectonic movement has thrown up range after range of mountains between the eastern slopes of the Rockies and the Pacific Coast. Cubley is particularly interested in gap between a couple of those ranges, a place where two sections of crust have moved in a way that stretches the surface rock. 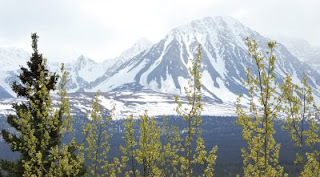 It’s a 200-kilometre-wide zone of jumbled ridges and valleys called the Grand Forks Complex, lying roughly between Castlegar and Revelstoke in southern British Columbia and extending down into Washington State. in Canada, were created by slow tectonic movement. A feature of the Grand Forks Complex is occasional outcrops of metamorphic rocks, hundreds of millions of years older than the surrounding rock. How did they get there? That, in simple terms, was the subject of Cubley’s doctoral research. “Metamorphic rocks are just rocks that have been cooked,” he says. Where Earth’s crust is pulling apart strongly enough to create a crack or fault, super-hot “cooked” rock can well up from far below the surface. Cubley suspected that the metamorphic rock in the Grand Forks Complex was evidence of a fault. But where? In places like the Great Rift Valley in Africa, the fault is obvious – and huge. But the fault associated with the metamorphic rocks of the Grand Forks Complex would be much smaller and harder to spot. Cubley tackled the problem in the traditional geologist’s way, by sampling and mapping rocks on foot. He spent several summers bushwhacking across the rough, wild landscape of south-central British Columbia, camping, hauling gear, and swatting bugs. When he finally found the fault, it was a bit of a let-down. But not for long. Cubley’s soul bounced back, and he’s well on his way to understanding how that modest ravine is linked to the unusual rocks of the Grand Forks Complex. What he knows at this point is that the metamorphic rocks were formed at a depth of about 20 kilometres and a temperature of about 750 degrees C. Roughly 50 million years ago (almost yesterday in geologic terms), they welled all the way up to the surface and then cooled very quickly. “I still can’t explain how they got to the surface that quickly,” Cubley says. But, with the help of a great deal of modern technology (and some more bushwhacking), he’s working on it. What Makes an Octopus Blush - and How Exactly Do They Do It? We've all heard about octopi that can change color to mimic their environment. But how do they do it? I discovered the answer when writing The Big Green Book of the Big Blue Sea for Kids Can Press. The book is designed to present information to kids ages 8-12, but also to engage them with cool hands-on (or do we call that "experiential" now?) activities. Most people learn best by doing, and doing stuff that involves splashing water is pretty well a can't-fail learning opportunity. The problem with octopi, though, was that I couldn't find a good activity anywhere out there to explain color-changing skin. I had to invent one. Coming up with ideas is pretty easy for me. But coming up with ideas that any klutz, I mean kid, can do (And I am the klutz in question; if I can't do it successfully, it won't go in the book) wasn't a piece of cake. Luckily, cake was not required. Waxed paper and food coloring, however, were. For all you lucky readers, here, in it's entirety, is the activity I invented. You'll find it, and many other fun and kooky things to try and do in The Big Green Book of the Big Blue Sea. Check it out, please! Make your own octopus skin in less time than it takes an octopus to blush. 1. Lay the newspaper on your work surface to protect it. 2. Lay down one sheet of waxed paper. Can you see the grayish newspaper through it? That’s the color of your octopus skin. 3. Staying away from the edges of the waxed paper, carefully place 10–20 drops of food coloring on the waxed paper about 1 cm (½ in.) apart. Can you still see the gray newspaper between the colored dots? 4. Hold the second sheet of waxed paper above the first sheet. Gently place it on top of the first sheet. See how the spots seem to spread out? Gently press on them with your thumb to spread them out even more. Can you still see the gray newspaper? Or does your octopus skin look yellow? 5. Lift the top sheet of waxed paper off the bottom sheet. Do the dots return to their original size? An octopus can change color to hide from prey or predators by blending into its surroundings. Many scientists think octopus also use color to communicate and express emotions, such as fear or dominance. But how do our wriggly friends achieve this tint-o-riffic trick? Octopus skin contains microscopic pigment-filled structures called chromatophores, represented here by the dots of food coloring. Real chromatophores are so small, you can’t usually see them. When an octopus wants to change its hue, it changes the size and shape of its chromatophores. Your thumb, forcing the dots to expand, acts like the small muscles in the octopus’s skin. They pull on the chromatophores to widen them. Now the skin they’re in is filled with color! 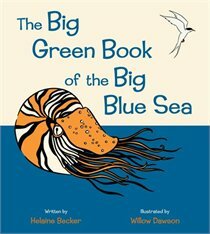 *Excerpted from The Big Green Book of the Big Blue Sea, Copyright 2011 by Helaine Becker, Kids Can Press, Publisher. All rights reserved. The farmhouse was old. The sixteen foot dining table we were seated at was too. This was a typical gathering with my in-laws, deeply committed Christians. It was during one such dinner that a someone said, "chimps share over 99% of our DNA because they were created by God to test our faith." By this time, I`d just spent several years of graduate school in the same department as the famed atheist Richard Dawkins. When I passed by his office, I used to stop to read the latest hate mail taped to his door, presumably sent by Christians who believed damning Dawkins to Hell was the best way to help him avoid it. So, while it was a shock at first, I was getting used to the fact that a few of Earth`s modern citizens believe humans walked alongside dinosaurs. In that Canadian dining room, face-to-face with similarly twisted logic, I realized the root of the "evolution vs. religion debate" is fear. The idea that humans came into being just like all the other beasts lovingly housed on the Ark threatens some Christians` identity in a way that is so terrifying they`ll do mental gymnastics to avoid it, and a few feel pushed to more aggressive defense tactics. I was glad of this insight when, as a student at teacher`s college, I was charged with teaching evolution to a class of grade 12s in a public high school in a large Ontario city. The experienced science teacher whose class I was borrowing, whose job it was to mentor me, confessed that he'd had a difficult time with the subject, though he'd not succumbed to the temptation of reducing the unit to a brief overview delivered in as little time as possible, as had some of his colleagues. In the photocopying room on the first day, a fellow student teacher exclaimed above the whizzing, flashing 21st century technology, "you`re allowed to teach that?" First, I asked the students to indicate if they believed in evolution - anonymously. About half of them indicated so. Then, I taught my heart out, while trying to calm potential fears: I mentioned the polls of scientists, half of whom report belief in a Higher Power; the same stats as the rest of the population. I suggested belief in God is not reliant on science for proof or disproof; indeed it cannot be. I told them about Christians who study evolution, and I compared the issue of evolution in our society to the long since (largely) resolved issue of the Earth being round, not flat. Recently, I’ve decided I might have been complicating the issue. Now, on the rare occasion that anyone asks, "what is evolution?" I say, "evolution is simply math." We have genes. Genes vary, so we`re all different. Any combination of genes that is more likely to survive and reproduce is… (Drum Roll)…more likely to survive and reproduce. I figure it is pretty hard to argue with that, though I`m sure someone will. Alas, if only our ideas evolved as efficiently as our genes do. What's NOT a black hole? Scientists and science fiction writers often influence or inspire each other. I gained some insight into that process during "When Words Collide," the Calgary science fiction and genre writers festival, earlier this year. 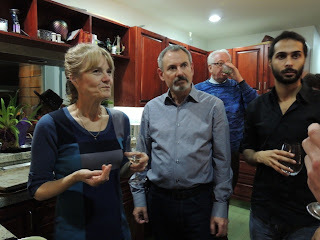 For example, David Wesley Hobill of the University of Calgary led a workshop in his special interest subjects: black holes, dark energy, and dark matter. I'm sure I'll over-simplify what he said, but his lecture shed some light on the "dark side of the universe" for me. Hobill talked about finding black holes by observing gravitational effects. For example, we may observe a quasar at a far distance from Earth. If something is between us and the quasar, we know the gravity of that object will bend the light coming from the quasar. This "gravitational lensing" results in multiple images. If we observe light bending or being redirected around an object, but we can't see what is causing the light to bend, we deduce that a black hole is likely the cause. - made of dense material. In fact, black holes are completely empty space, he said, caught at the moment of a change of energy. - and very very small. If our sun collapsed into a black hole, for example, it would implode the gravitational forces, and it would become 400,000 times smaller. In other words, Hobill said, it would end up being about the size of downtown Calgary. M. E Powell is the a Regina-based professional writer and the author of Dragonflies are Amazing (Scholastic Canada, 2007). This summer, I went journeying Into The Deep Past again. This time, it wasn't a chance to walk through my home neighbourhood again and see the geological changes that have shaped the world around me. Nope! 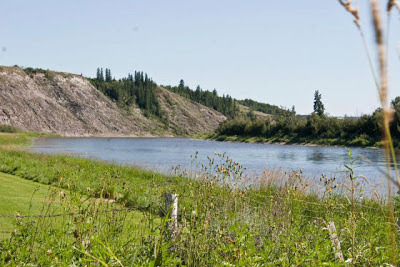 This time, instead of the familiar hills and ocean shorelines of Vancouver Island, I was exploring the Alberta Badlands along the Red Deer River. See that tiny dot mid-river, below the bluff? That's me in my kayak! There are so many ways of showing that process of being in a place and learning to understand what we are seeing. My daughter Lila Kladreau is a professional photographer; she took the photos above and below, which show me setting out on the river in an inflatable kayak that has served me well in many places close to home, and now on the river. These photographs contrast well to the painting artist Suzanne Robb made of another location a day's paddle downstream from my launch point. Here, Suzanne shows the striking patterns of weathering that are so visible from the river. The deep runnels that cut into the layers of sediment expose fossils from millions of years ago, when this area was under the shallow Bearpaw Sea. Suzanne's painting shows the colours as they are felt, instead of the muted way they are shown in Lila's photos. Eroded hillsides looked like dinosaur bones sticking out of the clay and sand -- and yes, there are dinosaur bones all through the sediments from 65 million years ago and older! 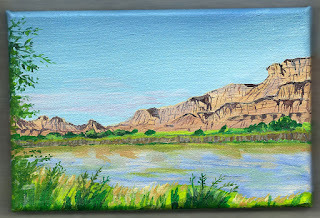 Other eroded bluffs along the river banks have round faces like Mount Rushmore, and some crumbles have sharp broken edges like profiles of faces looking up-river at the Buffalo Jump. It's wonderful how different people can be in the same place and create different ways of showing what they have learned. I'm not the photographer that Lila is, nor the painter that Suzanne is. I use other technology to help show people where I've been. One of my best tools is the SPOT device. It's a small electronic device a little bigger than a cell phone. Press the OK button, and it sends a signal to any passing communications satellite to send a pre-written message to up to ten of my friends, with a link to my GPS location on a map. This is a map of the first message I sent from the Red Deer River. The map of my second day's travels shows that I went through Dry Island Buffalo Jump Park and camped near Tolman Bridge. The spot marked 4 on the next map shows where I looked at the buffalo jump and the mesa called Dry Island. Some maps look better on a satellite photo, like this one that even shows the shadow of a few little clouds. The buffalo jump is impressive if you know what you're looking at; a cliff becomes a cliff where the buffalo would fall, not just a crumbly bluff. And below wasn't just a jumble of muddy crumbles mixed with old bones. It was the place where people would have been waiting with spears to finish off the buffalo, after the runners had driven them off the cliff. Falling a hundred feet onto its head doesn't kill a buffalo. But the fall does stun it or break a leg, so it's easier to kill. And then, there's lots of water here from the river and a nearby stream, for the butchering and cooking. The science of buffalo hunting makes sense when you can see the cliff and the water. The river makes more sense in some ways, too, when I see it on the map that shows how few roads there are in this part of Alberta, or on the satellite photo that shows how the river gouged out its little canyon through this dry land. The SPOT is no substitute for a camera, but it's a good tool to have for keeping track of where I've been. Ultimately, nothing matches being there, feeling the slippery clay clinging to my feet, or the tea-brown river quietly slipping between banks where cattle graze and swallows dart. Photo and Video by Shar Levine, taken in Vernon, BC at Planet Honey. In my book, "Paperbook and Papermaker", I wrote about wasps who were given colored paper to munch on and who, in turn, produced rainbow colored nests in the confines of the scientist's screened sunroom. I'm certain the scientist's wife was less than pleased to have this experiment buzzing around her home, but that's a different story and I digress. Flash forward to summer of 2012 when bees in France began creating colorful honey. Andre Frieh, an apiarist who lives near Colmar in the eastern part of France, was stunned to discover that honey from his hives was technicolor shades of blue and green. Fingers were soon pointed towards the local M and M candy factory where residue from containers was thought to be the cause of the unique shades. As any honey lover knows- describing something as "honey colored" can have different meanings. Honey can be light yellow to deep amber, or almost brown. It has different flavors depending on the kinds of flowers bees were visiting. There's Buckwheat, MacNut, Clover, you name it. While it might seem shocking to know that bees will be drawn to junk food, this is not the first time the insects have chosen artificial over natural sugars. In November of 2010, bees near the Dell's Maraschino Cherry Company in Red Hook, New York began producing red colored honey. Samples sent to test labs confirmed that the honey contained Red Dye No. 40, which is, as we all know, the color that gives maraschino cherries their vibrant look. If bees don't know they ought not to be eating junk food, what hope is there for the rest of us? I love visiting different places and learning from different cultures. My husband and I have moved a whopping 24 times! With our children, we once traveled for a whole year. And with an adventurous park ranger father and a writing mother, it might be natural that my children did not find jobs that offer any kind of monotony or lack of excitement! While both of my sons are avid divers, my son Alex is currently working toward a captain’s license on the MV Nautilus Swell. This refurbished tug boat is now a small, luxurious cruise ship that carries extreme divers to Alaska. The company’s other boat, the Nautilus Explorer, sails to Mexico where they dive with great white sharks (http://www.nautilusexplorer.com/guadalupe_great_white_shark_diving). “Rough day at the office. It was noisy. Bald eagles wouldn't stop screaming at each other over the salmon that were running in the stream nearby. It was hectic. Three grizzlies and a black bear on the beach while at the same time a group of humpbacks swam through our anchorage - didn't know which way to turn.” That does sound like a rough day at the office! Imagine you’re a sailor more than 300 years ago. A storm takes you out of sight of land and you don’t know your location. You worry you could run out of fresh water and food or pirates might attack. Clouds hide the Sun and make it difficult to tell your direction. You have a compass but maps in the 1700s are not very accurate. With night coming, all you can do is hope your ship doesn’t hit any rocks. Now suppose your only compass falls into the sea! Good thing you know a bit about celestial navigation. If the Moon should rise before the Sun sets, you will be able to tell your direction. The rising Moon is illuminated on its west side because the Sun sets in the west. But if you look after midnight, the eastern side is lit. If the sky clears you’ll be able to find Polaris, the North Star. You can use your sextant to measure the angle of a star or other celestial body. This tells you your latitude—how far north or south you are from the equator. Celestial navigation can save your life. But you still need to know your longitude—your direction east and west. 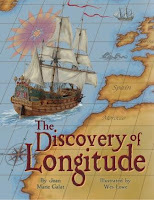 A carpenter named John Harrison spent many years trying to solve the problem of determining longitude at sea. 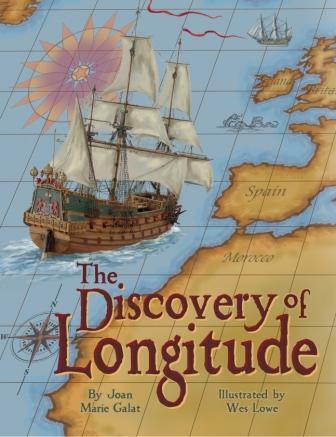 He realized that if you knew the time at a specific location on land, as well as your exact time at sea, you could figure out your longitude. Unfortunately, time pieces were not very accurate at this time. Clocks with pendulums could not keep accurate time on a boat. Harrison devoted his life to solving the problem but it took the King of England to make sure he got the recognition he deserved. Thanks to Harrison’s work, everyone on Earth recognizes the same time zones. Publishing Company. Visit www.joangalat.com for details. This week marks an important anniversary. 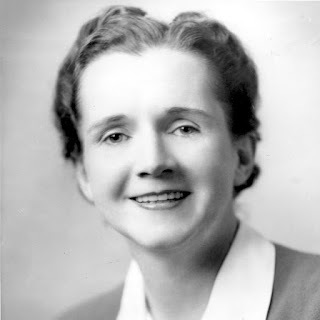 Fifty years ago yesterday - September 27, 1962 - was the official publication date of Rachel Carson’s book, Silent Spring. It was a ground-breaking, impeccably researched, and lyrically written chronicle of the damage being done to the environment by excessive use of synthetic chemicals, especially DDT. And it’s generally credited with launching the environmental movement. Even before Silent Spring reached bookstore shelves, its friends and foes were lining up to do battle. The book had been serialized in the New Yorker magazine over the previous summer, so its contents were no secret. One of the big chemical companies threatened a lawsuit in an attempt to block publication, but Carson’s publishers went ahead anyway. With thousands of pre-orders and a spot on the Book of the Month Club roster, Silent Spring was heading for the best-seller list. 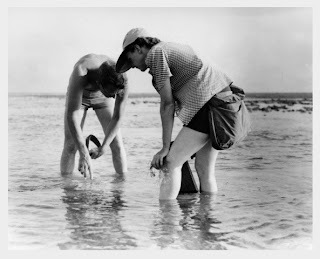 And Rachel Carson was heading into battle. She was an unlikely environmental warrior. Born in 1907, Carson was a biologist who had worked for the United States government until her successful books about the ocean made it possible for her to quit and write full-time. She was a quiet, private person who had worked hard all her life, supporting her parents, sisters, nieces, and an adopted son. Walks along the seashore and peaceful hours of writing were what she wanted – not a public platform. But the public platform is what she got. As soon as the book appeared, it was attacked by spokesmen for the big, powerful chemical companies, by agriculture departments, by scientists who had tied their reputations to the chemical revolution of the 40s and 50s, and by a lot of politicians who knew where their campaign funds came from. The problem facing her opponents, however, was that Carson had done her homework. Her research was solid, and she had consulted the leading experts in the United States and beyond. She had facts on her side. Stymied in their attempts to attack the book’s content, Carson’s opponents turned to attacking its author. She was called a hysterical woman, a fanatic devotee of bird-huggers and organic gardeners, even a tool of subversive (read Communist) forces that were threatening America’s food supply by trying to ban all pesticides (a position Carson never took). It was the kind of firestorm of personal attacks that American climate scientists face today. Through it all, Carson remained calm, polite, and eminently rational – all the more remarkable because she was desperately ill. In fact, she was dying of breast cancer, although very few people knew it. Her words, both written and spoken, won her plenty of supporters, including the American President, John Kennedy. By the time she died, just 18 months after the publication of Silent Spring, Carson knew she had made a difference and that the first steps were being taken to control the use of pesticides and other chemicals and limit their environmental impact. For about twenty years now, scientists have been studying evolution using a new kind of life form - a digital one. 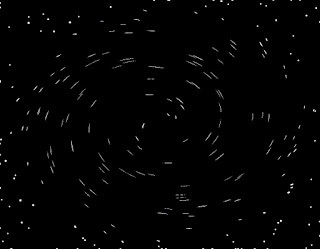 Digital organisms are programs designed to replicate their own code, and were originally inspired by computer viruses. Their computer-based habitats are restricted in space (RAM) and restricted in energy (the CPU time required to run the program). As the organisms reproduce, errors are introduced into their codes at a fixed frequency - the mutation rate. This results in a genetically variable population which is competing for resources. And because some variants in the population can reproduce faster, while randomly-chosen organisms are periodically deleted from the system (simulating death), the composition of the population shifts over time. In other words, the digital species evolves. There are major advantages to using digital organisms in the study of evolution. For one thing, complex carbon-based life forms tend to have long generation times, making it difficult to observe evolution in action. With some exceptions, such as Darwin's finches, scientists are usually restricted to studies of the fossil record, or relationships between living species. This research is therefore largely observational. Experiments on evolution can normally be done only on carbon-based bacteria and viruses, and even then, it takes years to propagate the population through enough generations for evolution to occur. In contrast, digital organisms can go through thousands of generations in just a few hours. More importantly, because digital organisms share no history with life on earth, they are a completely independent example of evolution. This allows scientists to distinguish general principles of evolution from quirks that might be specific to DNA-based organisms. Some of the most interesting results to come out of this research relate to complexity. In most cases, digital organisms develop faster replication rates by losing code - stripping themselves down to the essential instructions required for reproduction. In other words, they get simpler over time. Under computational scenarios, however, simple organisms can obtain numbers from their environment (equivalent to necessary chemicals or food resources). If they have the right code (genes), they can perform calculations using these numbers (just as carbon-based life forms use enzymes to transform nutrients). They then release the products of the computation back into the environment. If those products are deemed beneficial, the organism is rewarded with an increase in fitness - the ability to replicate more quickly. 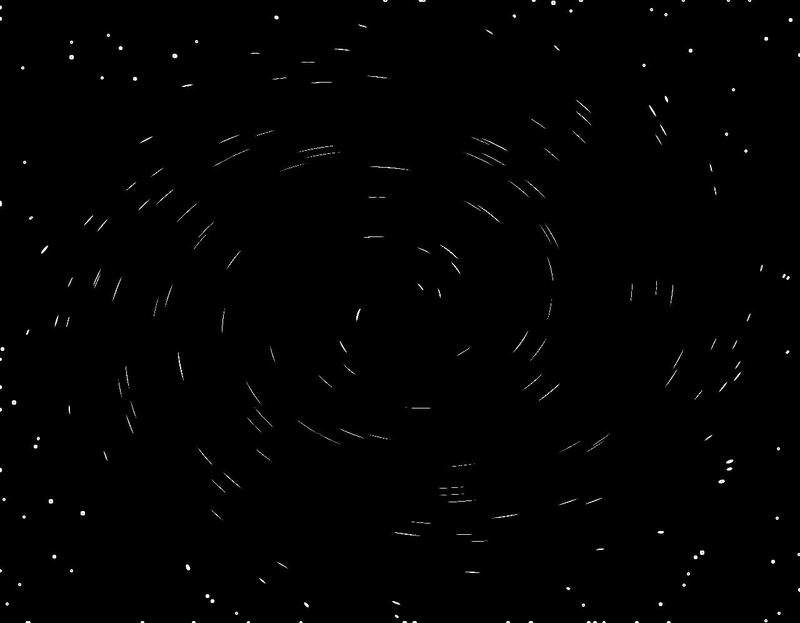 As mutations which allow new computations are rewarded, what results is a spontaneous increase in complexity over time. In fact, over the course of several hundred generations, digital organisms evolve that can perform up to 50 distinct calculations. Another mind-blowing result of this research is the spontaneous evolution of parasites - digital organisms with stripped-down genomes that piggy-back on more complex organisms, using the code of their hosts to copy themselves. This is exactly what the average cold virus does when it infects a human nose. What's even more incredible is that the host organisms begin to evolve parasite resistance, launching a digital arms race analogous to that between influenza and annual flu shots! Digital organisms are a powerful model system, but there is also scientific interest in studying them as life forms in their own right. I suspect Isaac Asimov would approve. Science Plus Kids TV Equals Fun! For the last three years, alongside my other writing projects, I've been the staff writer for a science- and environment-themed television show for children called Planet Echo (You can see it on APTN, or watch it on line.). The segment I write is called Dr. Greenie's Mad Lab. It mixes serious, science-y information with an abundance of fart jokes. Hey, what's not to like? 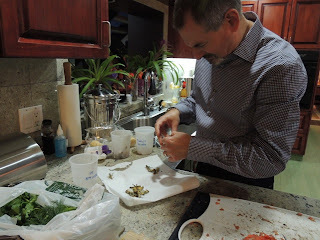 Dr. Greenie mixing up something gross - and educational! - in his lab. ﻿﻿The Mad Lab segment has indeed proven so popular with viewers that we are spinning it off into a stand-alone show. Some sample footage from the new show was submitted recently to the Juried competition at MIP Junior, the preeminent international trade show for children's television. And guess what! Dr. Greenie's Mad Lab has been selected as a finalist! The awards will be given out at a chi-chi red carpet gala in Cannes on October 7. Alas, a plane ticket to attend the event is not in my pay package; I will have to get the news of the winner via a tweet from producer Chris Greaves. In the meantime, I'm adding tweaks to the all-new webisode for the show, an exciting project that includes both a fun plot and three interactive games kids can play on their tablet or phone. Watch this space for news of the award winners, and wish us luck! It’s an Animal! It’s a Plant! No, It’s a Slime Mold! Dog Vomit Slime. Pretzel Slime. Wolf’s Milk Slime. Insect Egg Slime. 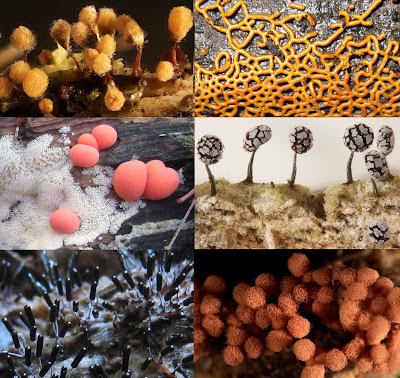 These are just a few of the wacky names people have come up with to describe different species of myxomycetes, a group of peculiar miniature “critters” commonly known as slime molds. Pretzel Slime (the snakey one) and Wolf’s Milk Slime (the pink cushions). Slime molds make me happy – and not just because of their wacky names. They make me happy because almost everything about them is odd. One of their oddities is that they spend part of their lives behaving like animals and another part acting like plants or fungi. To see slime molds, it helps to get down on your knees in the woods, especially beside rotting logs in places were it’s damp and dimly lit. This is where many types of slime mold begin their lives as a loose sack of liquid, a huge single-cell with multiple nuclei. In this slimy form, called a “plasmodium,” the organism oozes slowly over and under dead leaves like a mammoth amoeba, speeding along at about a millimeter an hour. 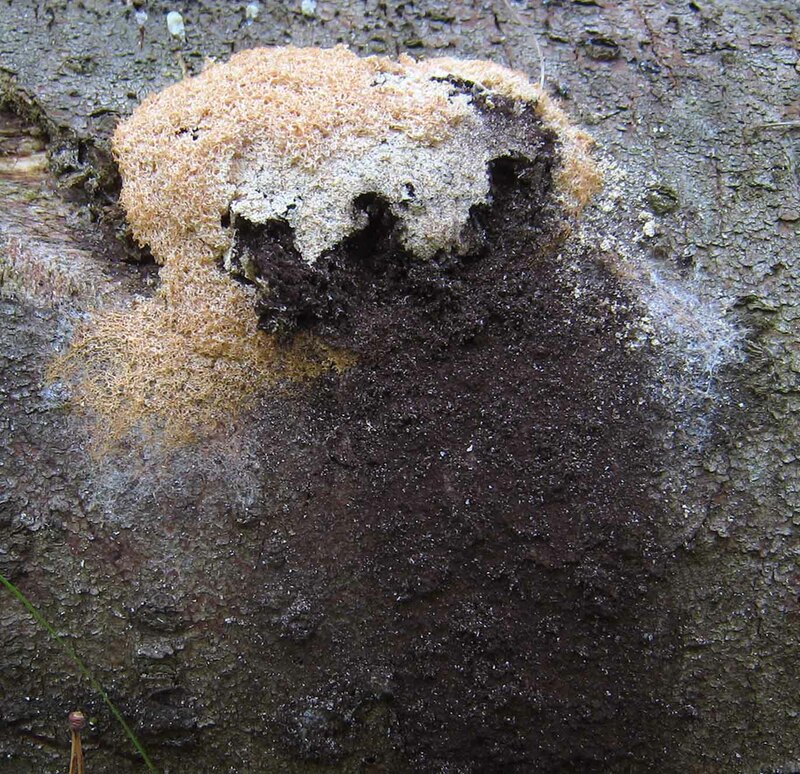 While it moves it feeds by engulfing and digesting bacteria, fungal spores, and even other slime molds. What’s really impressive is that this network of slippery muck behaves as if it has intelligence. It makes choices, veering towards food as if it’s hunting. In the lab, some slime molds are even able to figure out the shortest path to escape a maze. Stranger still, if the plasmodium is chopped into bits, the separated pieces will slowly migrate back together again! 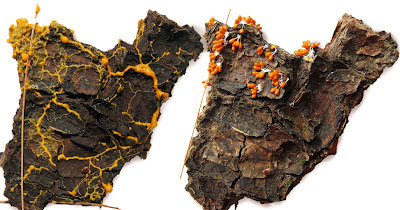 When food runs out, or the environment becomes too dry, slime molds search out a high spot, such as a log, to do their plant-like trick of sprouting fruiting bodies and releasing spores. This is the stage where they get fancy. The giant plasmodial cell divides itself into innumerable single cells that then form the fruiting bodies. In many species, some of these cells seem to sacrifice themselves for the good of the others by creating a stalk that will hold the spore-producing structures high enough to catch a breeze. When mature, the structure bursts open and the powdery spores are carried away by wind or passing animals. into hard-shelled orange fruiting bodies. More than 1,000 different slime molds have been identified, and they come in a startling variety of shapes and colors. 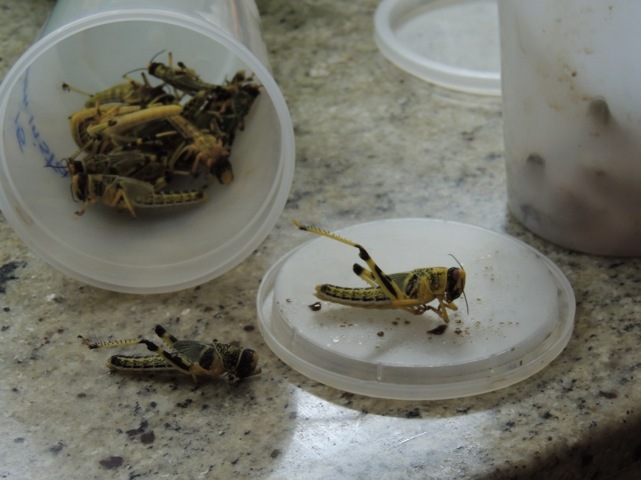 Some look like mini wieners-on-a-stick or ice-cream cones or pretzels, though at a size only a cricket could enjoy. Others have shimmering, metallic coats, or are encased in a cracked white crust. Yet others look like delicate coral. One of my favorites, Wolf’s Milk Slime, will squirt pink goo at you if you poke it with a stick. There’s even one that can grow so large, and is so ugly, that some people blame their neighbor’s dog for its appearance in their garden or on their woodpile. That one’s scientific name is Fuligo septica, otherwise known as – you guessed it – Dog Vomit Slime. A small, mature Dog Vomit Slime (Fuligo septica) releasing its spores.